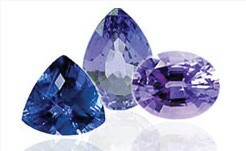 The popularity of Tanzanite is growing steadily. AnchorCert customers are pleased to have this clear and authorative grading standard to help the consumer understand the variation in quality and price of this rare and precious stone. The vivid colour and excellent clarity of top quality Tanzanite is particularly evident in larger stones and it is not unusual to see a Tanzanite of several carats, often in a stunning setting, enhanced by diamonds. Tanzanite set jewellery is therefore likely to be expensive and, understandably, the consumer wants to know what they are buying and be sure it is the real thing. 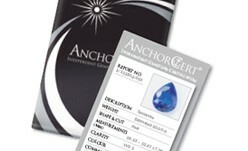 AnchorCert is the only Laboratory in the UK to have its own grading system for Tanzanite. Under the system, stones are split into one of four colour classifications depending on the intensity of colour and regardless of whether they are violet or blue. The commonly used ‘A’ system has been applied with AnchorCert grades ranging from ‘A’ for Pale to ‘AAAA’ for Vivid. Clarity grades are given according to the coloured stone grading system for Type I, Type II and Type III gemstones. These grades range from IF (Internally Flawless) to I3 (Included). Tanzanite is a type I gemstone. The Tanzanite Report is provided on the popular credit card size Mini Report. Stones are tested for authenticity and checked for cobalt coating, which is the latest treatment that AnchorCert gemmologists have discovered. Both loose and mounted Tanzanites can be graded/assessed on this report. Tanzanite was born over 500 million years ago when Mt. Kilimanjaro erupted in an area that was to become East Africa. The eruption caused a unique set of conditions to form deep within the earth - heat and pressure mixed with rare chemicals such as Vanadium to allow this exceptionally rare gem stone to form. These conditions remained constant for the entire 500 million years and Tanzanite grew. It was first discovered by Maasai Tribesmen in 1967 when an enormous grassfire swept the land below Kilimanjaro clear. As Tanzanite is a brownish colour in its rough state, the crystals lying on the surface were never noticed. After the grassfire had burnt the land and heated the stones, they turned a bright, glittering violet-blue, making the gems sparkle in the sunlight. Today thousands of fortunate people have the privilege of wearing this beautiful gem stone but as more and more people learn about it and desire it, the more the source is mined. The top quality, deeply saturated Tanzanite gem stones (AAAA) are only 0.13% of mined Tanzanite and are becoming extremely hard to find.